France has called the international community to respond with force if it is proved true that the Syrian government carried out a chemical attack on civilians. "There would have to be reaction with force in Syria from the international community, but there is no question of sending troops on the ground," Foreign Minister Laurent Fabius said on French television network BFM. He also said the situation could be handled "in other ways" if the UN Security Council could not make a decision. He did not elaborate. The French minister then demanded an inspection of the gas attack, saying that if the Syrian government of Bashar refused the inspection, "this will mean that it is guilty." Other countries also weighed in on the issue. Britain said its first priority was to verify the facts surrounding the alleged use of chemical weapons in Syria, but said it could not rule out any option to put a halt to the bloodshed. ""We believe a political solution is the best way to end the bloodshed," a spokesman from the British Foreign Office told Reuters. "However, the Prime Minister and Foreign Secretary have said many times we cannot rule out any option ... that might save innocent lives in Syria." “This is the responsibility for the sides who still set these red lines and for all of us," Turkish Foreign Minister Ahmet Davutoglu told reporters in Berlin, where he was meeting with his German counterpart Guido Westerwelle. For its part, Germany has asked Syria to “immediately” give full access to UN chemicals weapons experts to investigate the alleged attack. 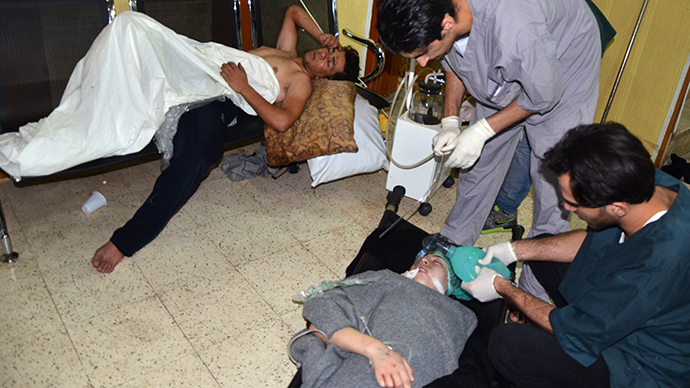 On Wednesday, a gas attack was reported by opposition activists in the capital Damascus. The number of people reported killed varies from dozens up to 1,300. Rebel groups blamed the incident on President Bashar Assad's forces, while the government sees it as an effort on the part of the rebels to draw international attention to their cause. The attack coincided with the visit of UN observers, coming to the country to investigate previous cases of chemical attacks in the war-torn country. 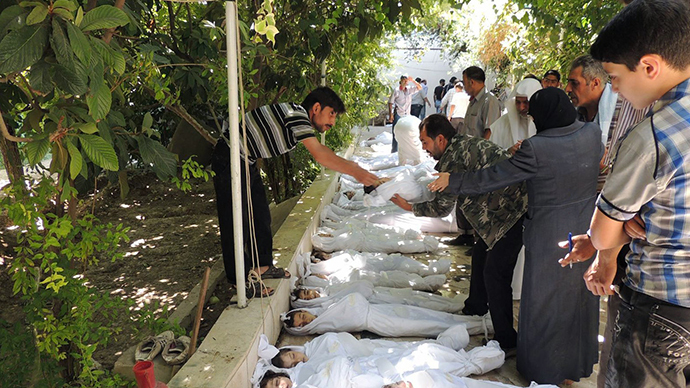 Bodies are still being discovered on the outskirts of Damascus, a Syrian opposition spokesman said on Thursday. "We expect the number (of dead) to grow because we just discovered a neighbourhood in Zamalka where there are houses full of dead people," Syrian National Coalition spokesman Khaled Saleh said, as quoted by Reuters. The UN Security Council (UNSC) said there must be "clarity" on what happened, following a closed-door emergency meeting overnight. 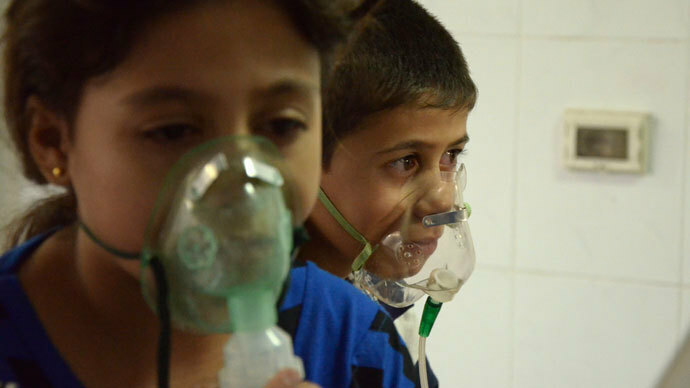 UN Deputy Secretary-General Jan Eliasson said that “we see the need to investigate this as soon as possible,” adding that there is no confirmation at this point of the use of chemical weapons. Although the UN has not attributed blame to either side in the attacks, the French minister, quoting The Syrian National Coalition, was quick to point the finger at Assad's forces. "It was a harsh attack and chemical weapons were used....If there has been use of chemical weapons, everyone says they come from Bashar," he said. Meanwhile, Washington demanded that the Syrian government allow a UN team already in the country "immediate and unfettered access" to the location of the alleged attack. The United States announced in June that it would send military aid to Syrian rebels, arguing Assad's government had crossed a "red line" by using chemical weapons in several attacks on villages. 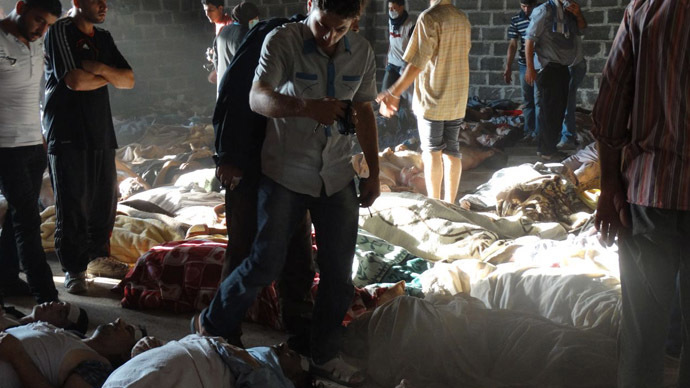 The Assad government has vehemently rejected all accusations that it used chemical weapons. Meanwhile, Russian officials remain skeptical of the claims that the Syrian government was behind the gas attack. Reports by “biased regional media” about alleged chemical weapons use near Damascus might be “a provocation planned in advance,” Russian Foreign Ministry spokesman, Aleksandr Lukashevich said on Wednesday. “It draws attention to the fact that biased regional media have immediately, as if on command, begun an aggressive information attack, laying all the responsibility on the government,” he added.